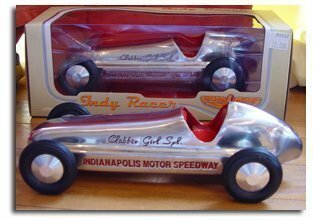 Another popular area of Indianapolis 500 Memorabilia collecting are the Wilbur Shaw aluminum toy race cars sold by mail and at souvenir stands at the Speedway. The cast aluminum cars are reproductions of Shaw's 1939 & 1940 winning Maserati with 1947 being the earliest known produced but it may be 1946. The cars measure 8 1/2" long by 3 1/2" wide at the outside of the Firestone tires (yes, these actually had Firestone stamped on the tires just like the real tires). They do have boxes which are a plain white box with no markings of any sort and were made of thin cardboard. The Little Bill Toy Company of Chicago Illinois did use a box and it will be discussed later. Although similar in appearance the cars below are not Shaw cars. At least *9 different types of Wilbur Shaw car are known to exist. Plain, Signature, Clabber Girl Spl., Painted, Painted Signature, Pace Car, 90th Anniversary, 90th Anniversary Clabber Girl and 100th Running. Plain versions have no other lettering except Indianapolis Motor Speedway stamped along the frame rails. The seat and lettering are all painted red as are all Shaw cars except those noted. Note the hole drilled into the bottom near the front where are a spring could be attached and placed around the rear axle so the car could be self propelled. 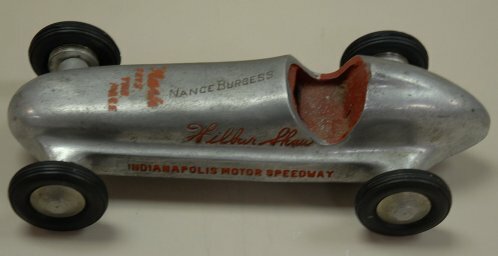 Signature versions are the same as the plain car except Wilbur Shaw's signature is stamped on both sides near the cowl above the frame rail. 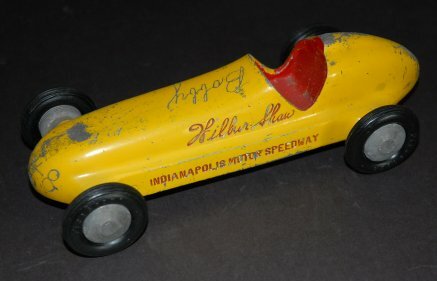 The Little Bill Toy Company of Chicago also sold Wilbur Shaw Signature cars as seen on the box below. A white painted signature Shaw car, like the one seen below, is also known to have been sold by the Little Bill Toy Company. Signature cars were advertised for sale in the Indianapolis Motor Speedways photo catalog for 1947. The signature car above has “Roger 1946” etched on the hood. While the date could’ve been added later, it may indicate that Shaw cars were first available in 1946, not 1947. Clabber Girl Spl. versions are the same as the plain car except Clabber Girl Spl. 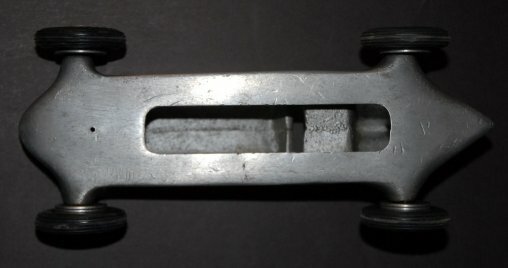 is stamped above the frame rail (car at left below). Speedway owner Tony Hulman owned the Clabber Girl Baking Powder Company and used the Shaw cars to promote it. This version was more than *likely given to friends, employees, VIP's, etc. by the Hulman family at Christmas time (note the unopened box with Christmas motif below). The red card from Tony Hulman more than likely went inside the box along with the Clabber Girl Spl. Shaw car. There is a version of this car where the stamping of “Clabber Girl Spl.” is very weak or non existent so a sticker was put in place of the stamping (car at right below). 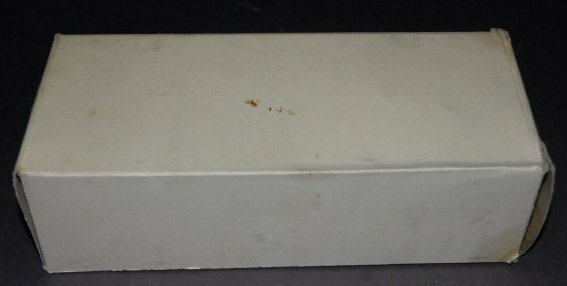 The unopened box with Christmas motif below is from from “A Hulman Jr.”. With a can of Clabber Girl baking powder on the label, a Clabber Girl Spl. has to be inside - could it be a Signature car too? It’ll remain a mystery as the owner has stated they’ll never open the box. *A Clabber Girl Signature car, which is a Signature car with Clabber Girl Spl. stamped on it (it’d be interesting to see where they’d fit all that and still have it look right), may exist. 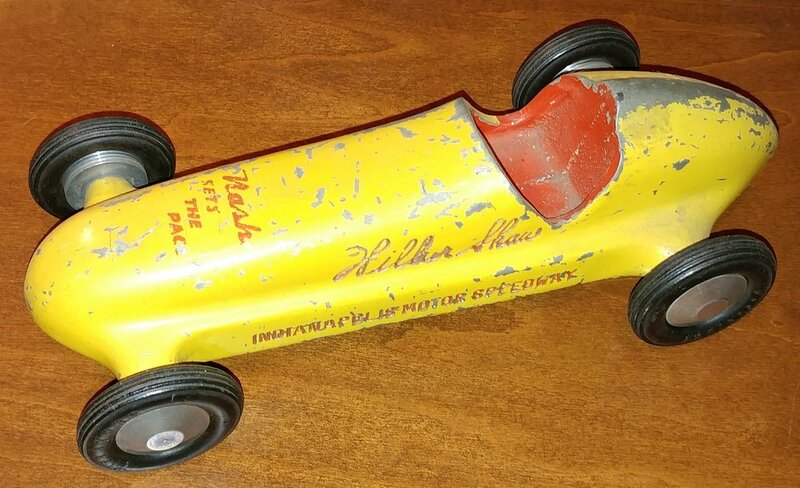 This is from the memory of a veteran collector of Shaw and toy cars who supposedly had this version long ago. Painted versions are found with and with out the Shaw signature. The known colors are: red, yellow, white and possibly blue and black. Note that for obvious reasons, the seat and lettering are in yellow on the red version. The maroon version below was a prize for selling the most papers from one of the three Indianapolis newspapers. The tires are slightly bigger and not Firestone. It is more than likely unique. Pace Car versions are Signature cars which feature the Nash pace car from 1947 or the Chevrolet pace car of 1948. 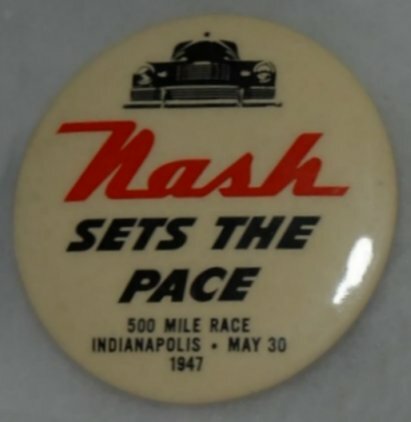 The Nash slogan was "Nash Sets The Pace" in 1947 which is seen engraved on the unpainted version at left in the top picture with "Nash" in red on the nose and "sets the pace", also in red, along the left side of the hood. There are five known* painted versions red, yellow, maroon, dull gray and tan which have "Nash Sets The Pace" either painted in red or a red decal (this is in yellow on the maroon version) on the hood. 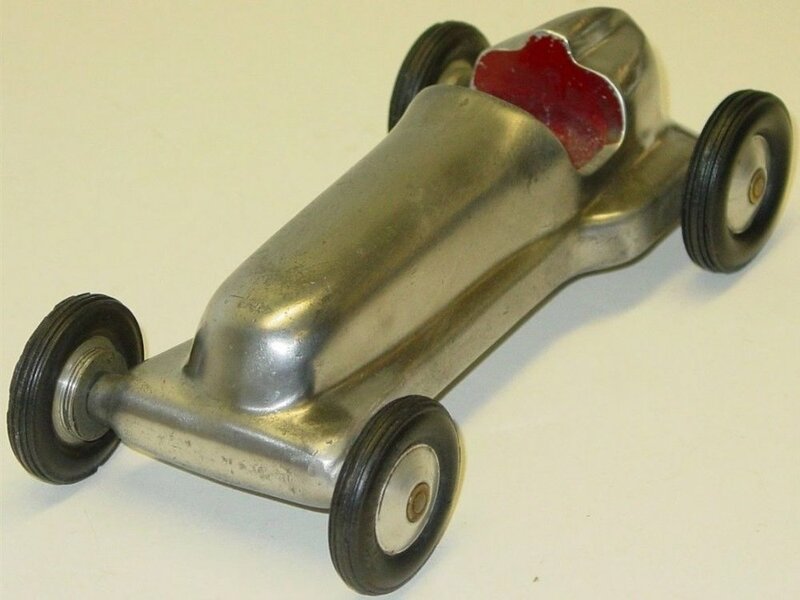 There is also an unpainted version of this car as seen below. 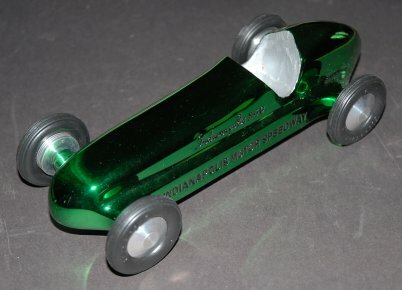 90th Anniversary versions are an exact scale Stainless Steel reproduction made especially for the 90th Running of the Indianapolis 500 May 28, 2006 and are made by the Greenlight company. These are the same as the Plain original version except stamped on both sides above the frame rail is "90th Running Indianapolis 500" in black. On the bottom is the date "May 28, 2006" and unlike the original version, this one has a small sticker at the rear of the car which states "Made in China". There are also green and blue color versions which were made in a limited number of 250 each. The seat is painted silver and the lettering is in black. These were not sold at the Speedway and had to be bought from Greenlight or an internet source. 90th Anniversary Clabber Girl Spl. The 90th Anniversary Clabber Girl Spl. version has "Clabber Girl Spl." stamped in place of "90th Running". This version may also have been used for promotion like the original Clabber Girl Spls.. Although made by Greenlight they were only available* through Clabber Girl. The boxes are much sturdier and have a lot of information on them compared with the plain white box of an original. 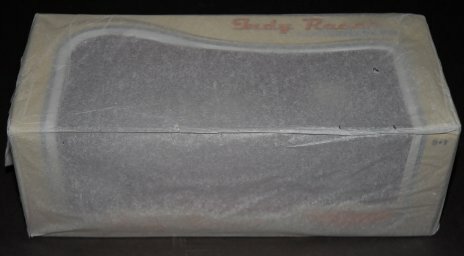 When purchased at the Speedway gift shop, they came wrapped in white tissue paper. 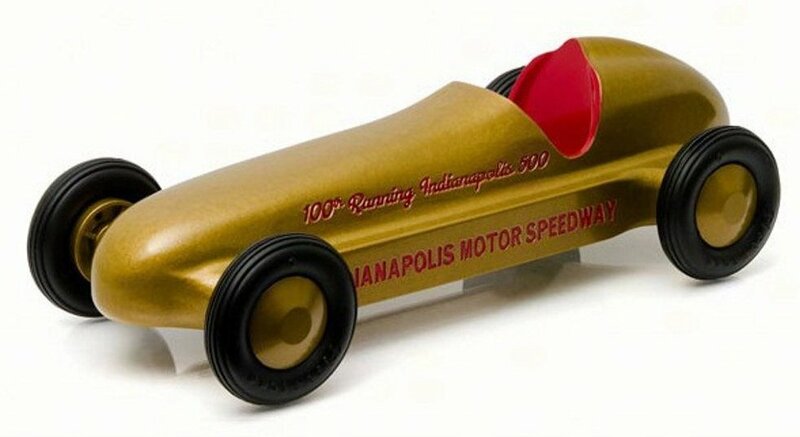 For the 100th Running of the Indianapolis 500 Greenlight issued a die-cast limited edition gold version of the Shaw car. 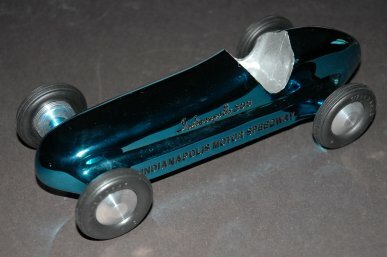 This version is die-cast (note the screws on the bottom where the car could be taken apart) and painted in gold foil with “100th Running Indianapolis 500” stamped above the frame rail on both sides and “Greenlight 2016 Made in China” stamped on the bottom. The back of the box has “Great “100” Facts” about the ‘500’ while one side depicts a scene from 1911 and the other 2015. The bottom has copyright information. Note that the 2015 Indianapolis 500 event logo is stated as Trademarked yet it is not on the box. Easy to tell from an original is this fairly well done resin model. As to a value or rarity of particular versions, the Pace Car versions and the Clabber Girl Spl. are at the top. Next are the Painted versions, Signature then Plain, signature and lastly plain. These cars can be altered to enhance the value so be aware of what cars are known and don’t hesitate to ask other collectors for help - it might just save you a lot of money. Condition is big a factor in determining value. It is common to find cars with engraving on it such as the yellow signature version at right. This is a personal decision whether etching or engraving adds or detracts from the value. The Shaw car above has been painted black and has different tires. Sometimes cars are found painted another color than what is listed here. These cars were sold as toys and kids painted them or put decals on them etc.. Whether this adds or detracts from the value is also a personal decision. Paint restoration of a painted version is also a personal decision for the same reasons as above. There are replacement parts such as axles and Firestone tires that are available for these cars. A car restored with the correct replacement parts does not change the value while those with incorrect replacement parts lower the value. Value is increased if one has the plain white box and especially so if it is the Little Bill Toy Company box which commands a premium. Clabber Girl Spl. versions which have the box and card also command a premium. For the 90th Anniversary Stainless Steel versions, the blue and green color versions are the toughest to find followed by the Clabber Girl Spl. while the Plain version is the easiest. Those kept unwrapped in the box will command a premium. As of 2018, the 100th Running version is still a relatively new item and can be found fairly easily.